20 OF THE BEST MEN'S SUMMER SHOES | muted. Having the right shoes in your arsenal this Summer will determine whether your outfit is kicking or if it’s lame. You don’t want to be the guy wearing black jeans and black shoes on a 90-degree day. You want to have the best Summer sneakers at your disposal. Below we’ve identified 20 Of The Best Men’s Summer Shoes. They’re not all white sneakers, some are off-white or cream, while others are a nice shade of blue. You’ll also see some cool retro sneakers on the list as well. Whatever the event you should see something to fit your needs. If there is one thing we have come to expect from Nike it is there ability to surprise us by taking a classic and putting a seasonal twist on it. 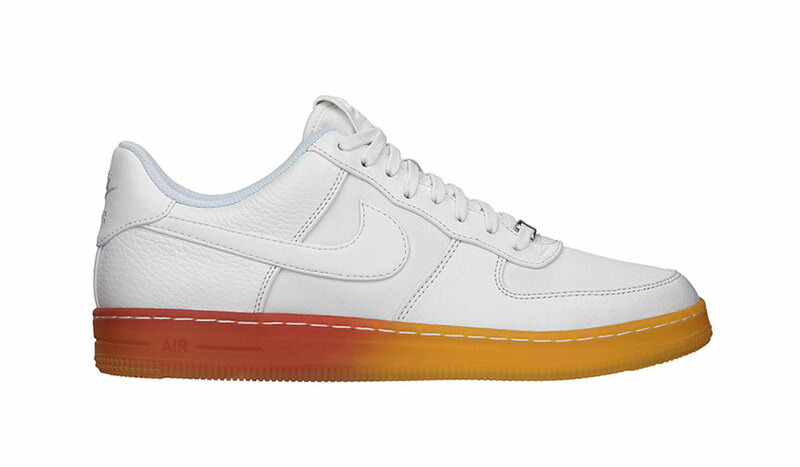 The Nike style we all know and love has had some tweaks and the result is the superb Air Force 1 Downtown Breeze ($135). The color, and styling, screams summer, and you can imagine them teamed with shorts while spending lazy days hanging out with the ladies or taking part in a few games of tennis. For the second season in succession we have a collaboration between Raf Simons and Adidas. This gives us an even greater collection of great sneakers which combine high end fashion design and sportswear. 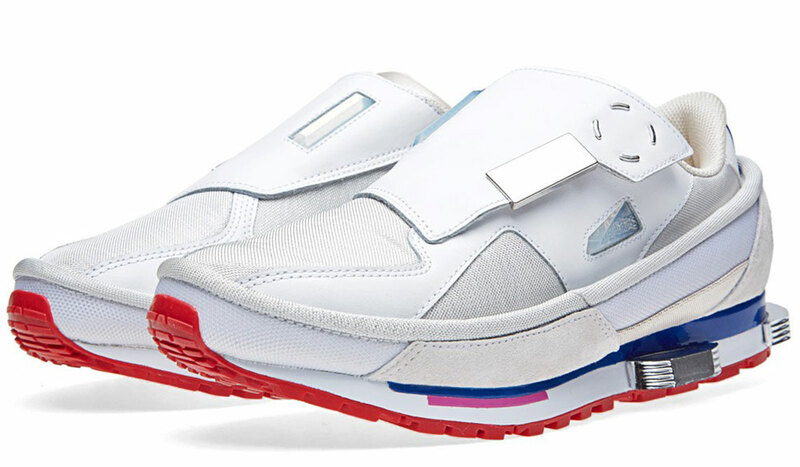 Simons has taken the shape of the iconic 1980’s Rising Star sneaker and given it a thoroughly modern makover and the result is the Adidas X Raf Simons Rising Star 2 White & University Red ($470). He’s incorporated his signature garment patters into the leather, nylon and mesh uppers with the use of geometric color blocks and vibrant accents akin to lego. With snap button closure, midsole that are also shock absorbers and dual branded insoles, this is the closest you will get to a perfect summer sneaker. In the time period between Memorial Day and the 4th of July, Reebok have given us a patriotic sneaker that not only looks cool but feels great when worn. 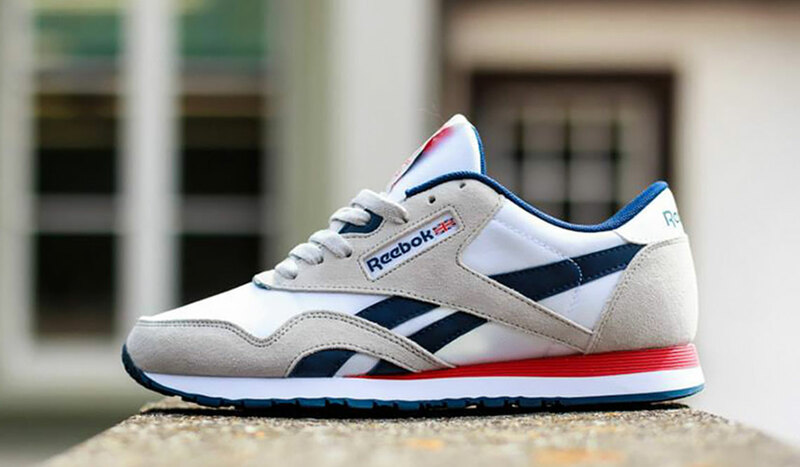 The Reebok CL Nylon SP ($90) has a white, red , blue and steel color way and the white nylon base, which is found in in the tongue, toe and midfoot sits beneath the branding strips of blue leather and the steel colored suede overlays. This is a mighty fine sneaker in more ways than one, and expect to see loads of these around the town this summer, and well into the fall. The launch of the Adidas Originals Select Collection – Tournament Edition ($120) has been the hot news in the sneaker world this month, and they were sure worth waiting for. Bearing the names of such tennis legends as Ilie Nastase and Rod Laver, as well as the iconic venue Forest Hills. Adidas have always been viewed as somewhat of a classy brand, and this collection will certainly cement their reputation. These are tennis shoes par excellence, and even those who don’t know a lob from a smash will want a pair of these. We are set for a scorching summer according to the weather men, but it’s doubtful it will be as hot as these new bad boys from the undisputed King of sneakers. 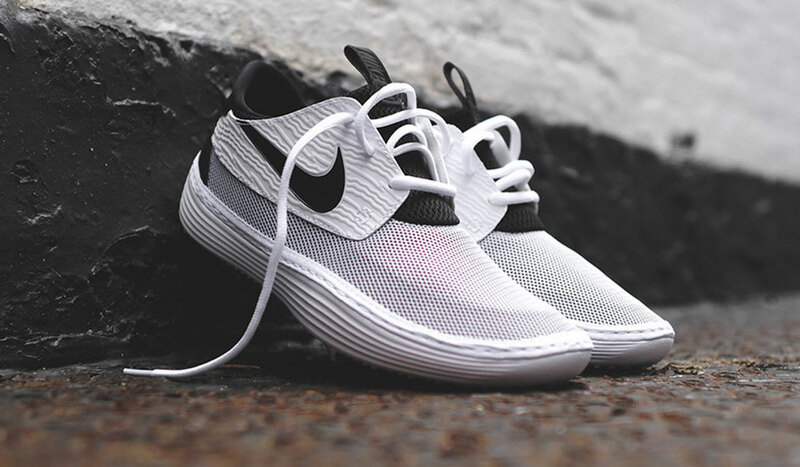 Out of nowhere Nike dropped these Nike Solarsoft Moccasin’s – Black & White ($65) on us and it didn’t take long for us to go wow. Profile wise, think boat shoes crossed with slippers, then some animal print thrown in for good measure before adding the white top. Sounds gross written like that doesn’t it? But feast your eyes on them, man they’re awesome! Okay okay, no doubt many of you know are singing the B – Ball bit from the Fresh Prince theme tune. Once you’ve stopped, as nobody knows all the words, cast your eyes over these mighty fine examples of how white shoes CAN look cool. There’s isn’t a better sneaker for summer than an uber comfortable shoe that just looks better and better the more you wear them. 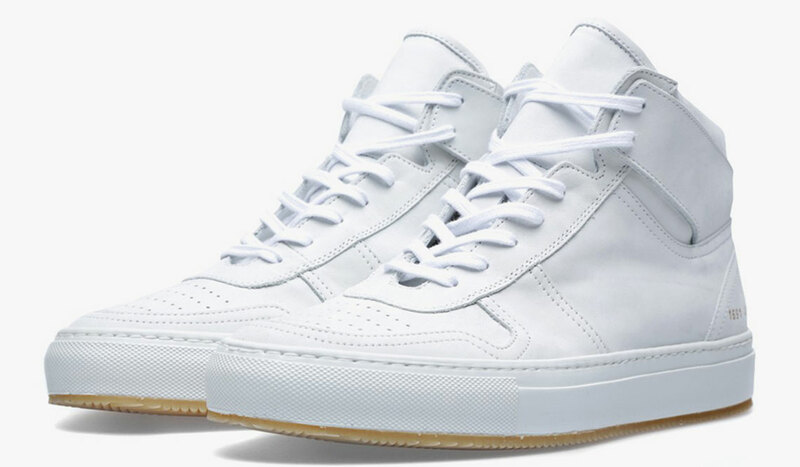 The Common Projects B-Ball High Sneaker ($495) is available in both high tops and standard sneaker styles, these are set to be as hot this summer as the sun bouncing off off them. With its fresh color way and addition of tasteful suede trim, these Adidas Originals Rod Laver ‘Running White’s ($121) could well be many people’s first choice when it comes to summer sneakers. The thing with these is that the genius of the design is so subtle and understated you may not even notice it at first glance, or even second. But once you cast your eyes all over these sneakers, and take in the profile, heel detail and of course that awesome color way, you too will be hooked. The classic Jack Purcell sneaker from Converse has has an upgrade. The new Converse Jack Purcell Leather Ox White & Navy ($9) retains its original silhouette and the rest of the features which made this sneaker an American icon. With uppers constructed from grain leather and a traditional low cut profile, the shoe is completed with the world famous smile which runs across the front of the OX’s vulcanised toe cap. 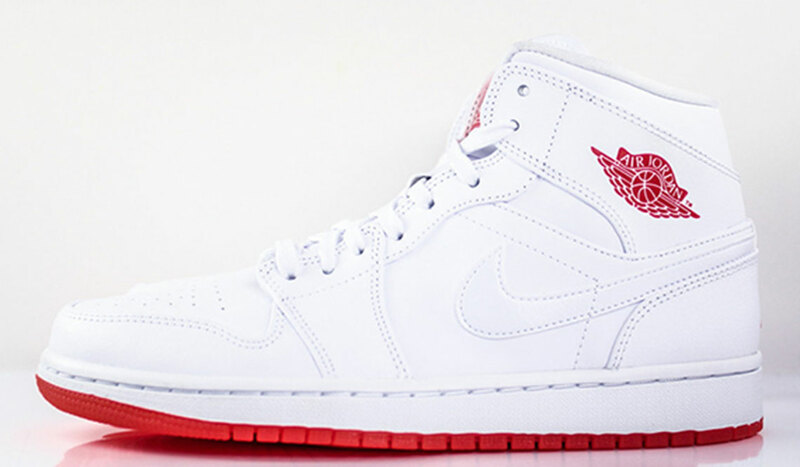 Once you spot the classic and uber cool colorway of the Chicago Bulls it is impossible to resist these new Air Jordan 1 mids – White & Infrared 23 ($110). The simple yet effective white and red combo, the Infrared of the name by the way, combine to create to make a perfect-for-summer sneaker that are both hot and cool. They have a retro, old school feel to them, which is a breath of fresh air for sneaker aficionados. Has there ever been a perfect pair of mid sneakers? That is open to debate but these come pretty darn close. 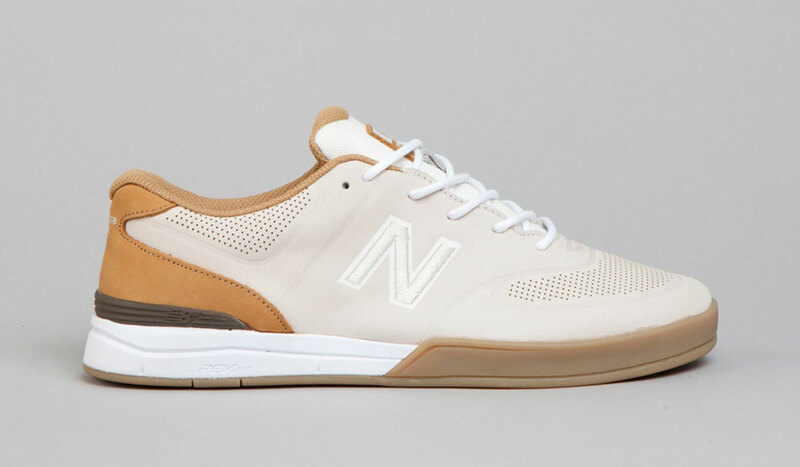 A sneaker with a name such as New Balance Numeric Logan 637 ‘Pristine Gum’ ($142) has to be pretty special to carry it off, and luckily for us this shoe certainly does. From a company who has give us some awesome skater shoes, this new line offers something a bit different, but in a very good way. The color way makes you think of ice cream sundaes with caramel sauce; the perfect summer dessert. This is the kind of sneaker that you will want to put your stamp on with a few well placed scuffs, and they are also that kind of sneaker that will look even better when personalized. 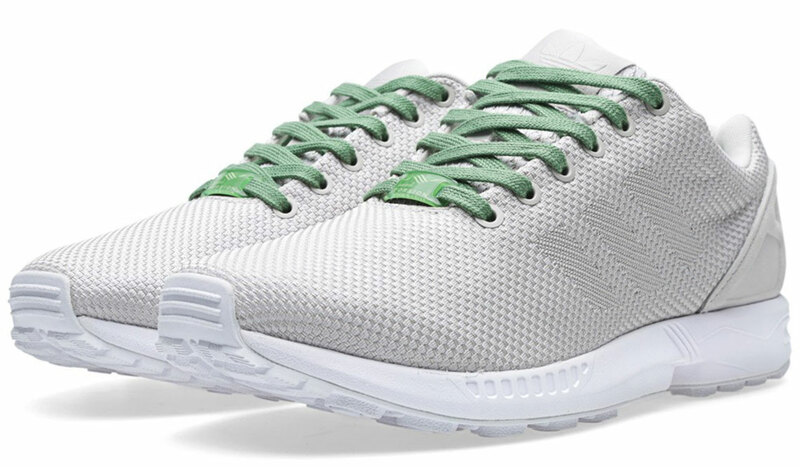 Adidas have stripped down their original silhouette of the iconic 1980’s ZX runner and given it a whole new look in the Adidas Zx Flux Weave Running White & Pea Green ($105). Ultra modern and ever so cool, the ZX Flux Weave runner is one of those shoes that brings back great memories and creates a whole lot of new ones when you slip them on. The lightweight flexibility you get from the tight weave of the upper makes them great for summer and the standard 3 stripe branding, moulded heel cage and the torsion midsole makes for a truly great sneaker that is set to be red hot this summer. This style of sneaker was first designed by Adidas in 1993, making is a modern classic in the history of the company. The Adidas EQT Support ‘Berlin’ ($135) has been inspired by the many city marathons which now take place around the world. The tonal suede lies over the top of the mesh, which also boasts the world famous 3 stripes. 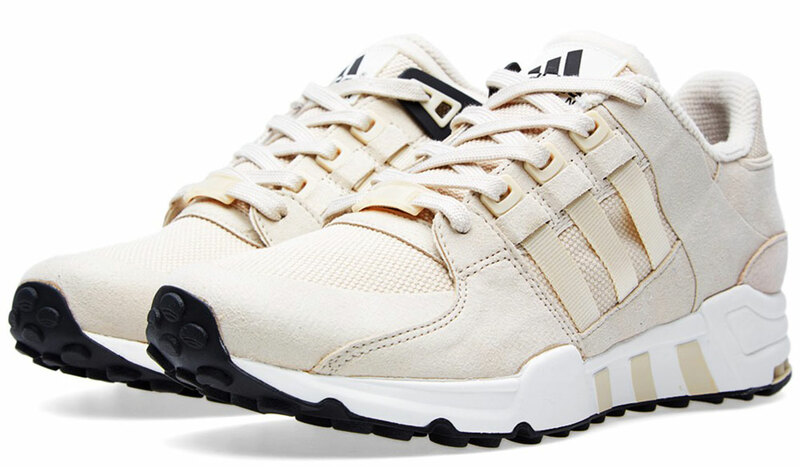 Features we have come to expect from Adidas are all here including the SUPPORT lace dubre and the branding in its instantly recognizable EQT colorway. Whether you take part in marathons or just watch them on the TV with a beer, you won’t go wrong this summer with these sneakers. We all love Air Jordan, fact. However, some of them are more suited to cooler weather and not exactly great in the summer heat. 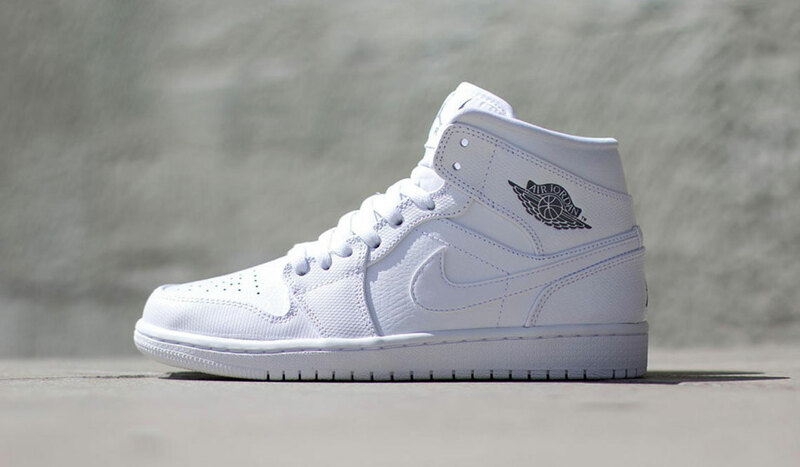 These new Air Jordan 1 Mid “White/Cool Grey-White” ($105) offer you a more subdued style of air Jordan but there is absolutely no compromise as far as style or comfort is concerned. The cool gray in the name can be hard to find at first but it is there, it’s the embroidered branding. 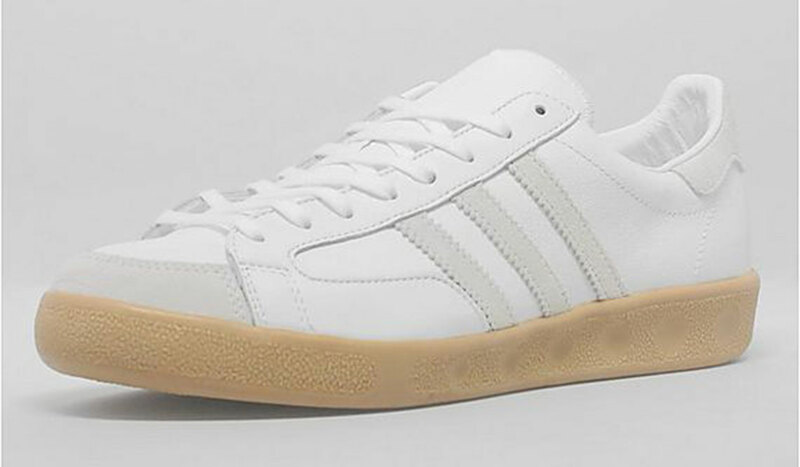 The white will soon get scuffed up and personalized, and then maybe this could become the perfect summer sneaker. If you are looking to an alternative to the more formal deck shoe then check out these awesome sneakers. 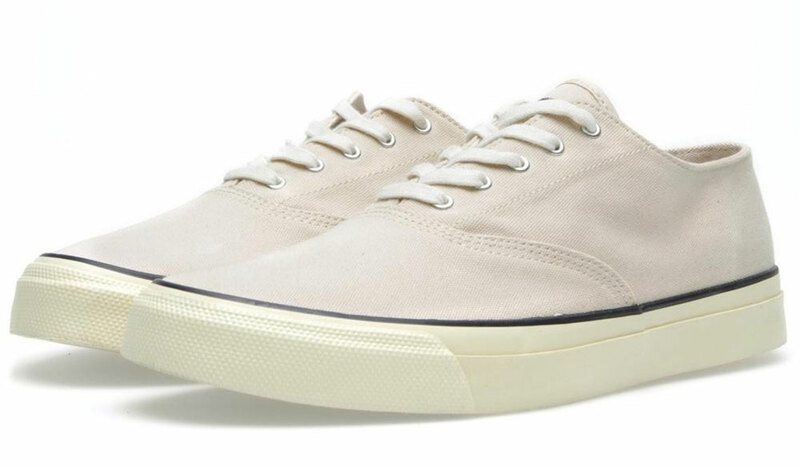 Sperry have given us in the past some of the best shoes of this type, and their Sperry Topsider Authentic Original CVO Canvas ($79) are one of the most iconic profiles of all time. The legendary Sperry laser cut sole is intact, and topped off with a tough, woven canvas upper. You can’t beat a canvas sneaker in the summer. They are light, comfortable, slip on and off within seconds and hey, you don’t even have to tie the laces if you don’t want to. Way back in the day when Nike and Adidas were just twinkles in the corporate eye, THE name is sports footwear was Fred Perry. 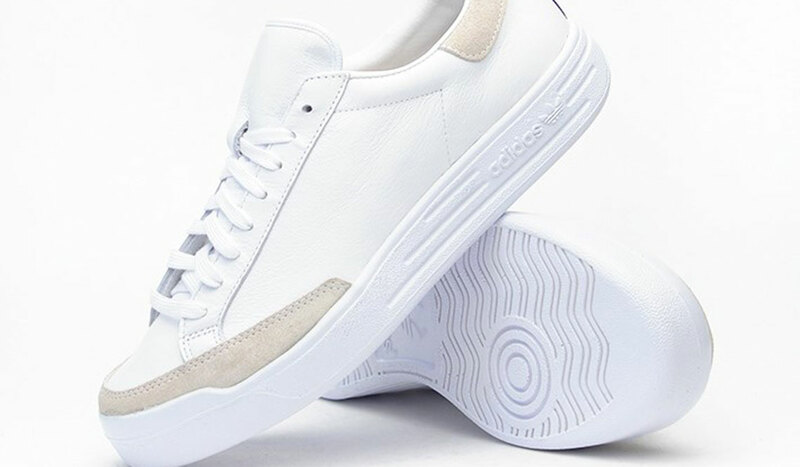 Named after the famous British tennis player, this brand has survived the onslaught of cutting edge, far east design gurus and still has its place in the modern sneaker world. They are also one of the most instantly recognizable, and if there wasn’t a name at the top of this article you would know these were Fred Perry’s. 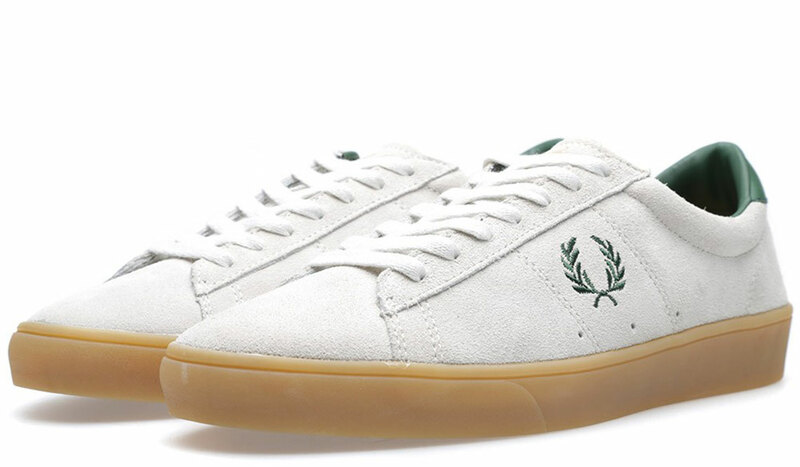 The Fred Perry Spencer Suede Porcelain & Tartan Green ($89) a modern reworking of the classic design is summer in a shoe, now all you need is the strawberries and cream. 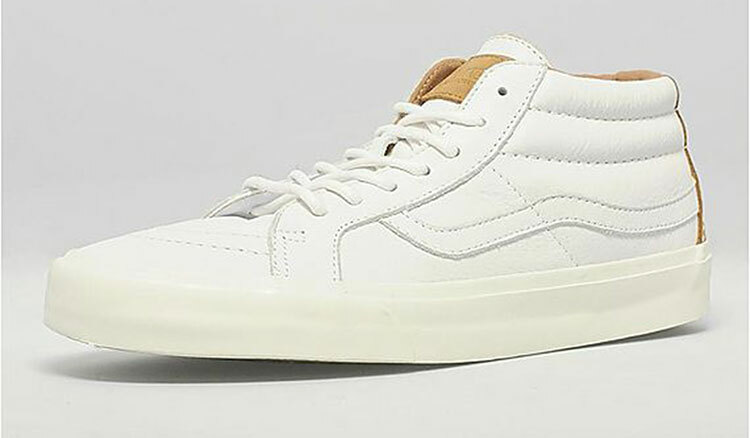 VANS SK8 MID CA ‘CLEAN WHITE’ – SIZE? These new Vans SK8 Mid CA ‘Clean White’ Sneakers ($134) are from the great Vans size?exclusive ‘Clean White’ pack. The uppers are created from premium white leather and the tonal branding adds a contrast on the side wall. There is also a funky stitch detail on the toe panel and the heel panel is finished in brown leather. The sneaker sits on the white midsole complete with gum waffle outsoles and the finishing touch ins the round, tonal laces. The tongue tab, which bears the brand, is off attractive tan leather and these shoes feel as great as they look. Awesome sneakers for the summer. With exemplary timing, Nike have released the latest iteration of their ever popular Rosherun sneaker. The Nike Rosherun Hyperfuse Sail & Medium Ore ($96) is the perfect showcase for the Nike Hyperfuse technology, which as we would expect sits atop the full length Nike Eva composite sole unit. The cool, clean lines of this shoe, couple with the uber comfortable insole with ridge sock liner is a winner. This shoe will be a firm favorite this summer with both sneakerheads and runners. Just in time for summer Nike have given us their latest incarnation of the Free 4.0 Flyknit sneaker. 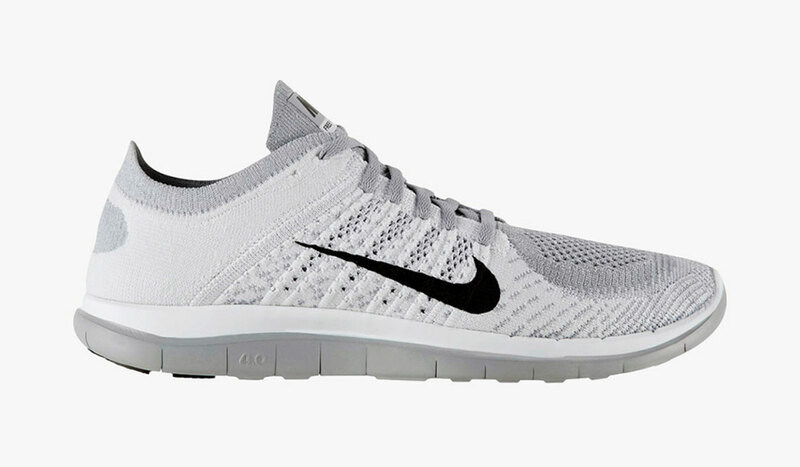 With more cushioning than the 3.0 version and which more flexibility that the 5.0, the Nike Summer 2014 Free 4.0 Flyknit ($120) boasts a one piece, supportive Flyknit upper which in entirely created from polyester yarn and the outsole in both highly flexible and low profile. The 6mm height difference between the forefoot and heel height, you naturally feel closer to the ground but with full cushioned support. The new summer colorways of Nike’s Free 4.0 Flyknit can be found in their online store and are selling for $120. 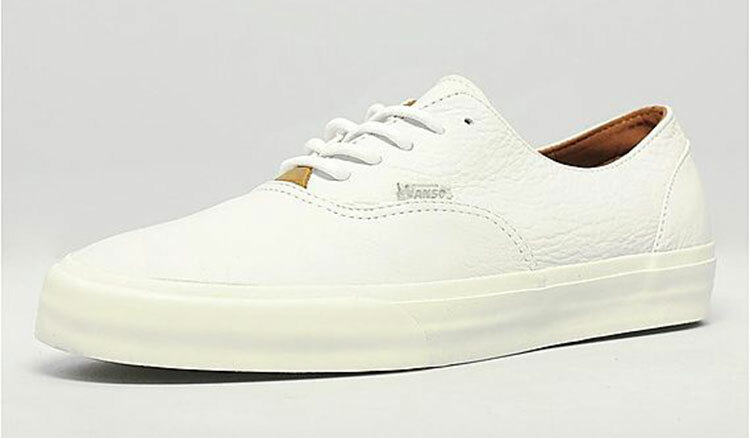 VANS ERA DECON CA ‘CLEAN WHITE’ – SIZE? Vans brings us this great sneaker in perfect time for the summer. This Vans Era Decon CA ‘Clean White’ ($TBA) comes from the exclusive size? Clean White set. The soft, premium leather is crisp snowy white is accented by the tan leather which sits at the base of the laces. 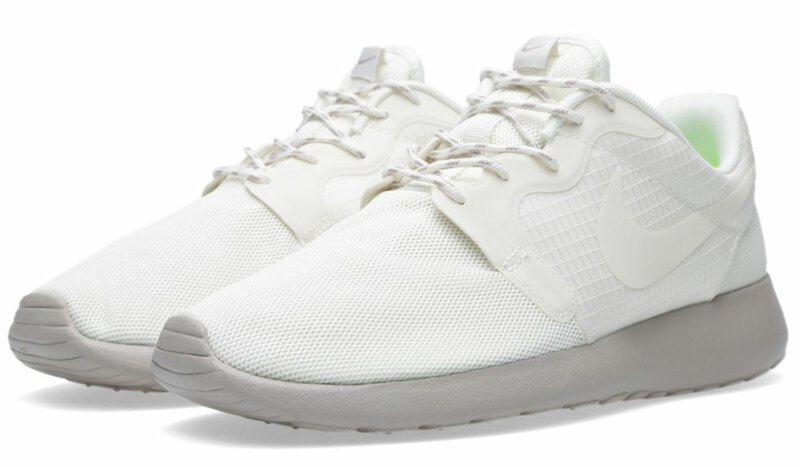 The white midsole supports the upper with style and has been finished off with a small brand tab in white on the side wall and the sneaker also has round, tonal laces. A prime example of how leather and fabric can look awesome together when constructed properly, these are great shoes, period. 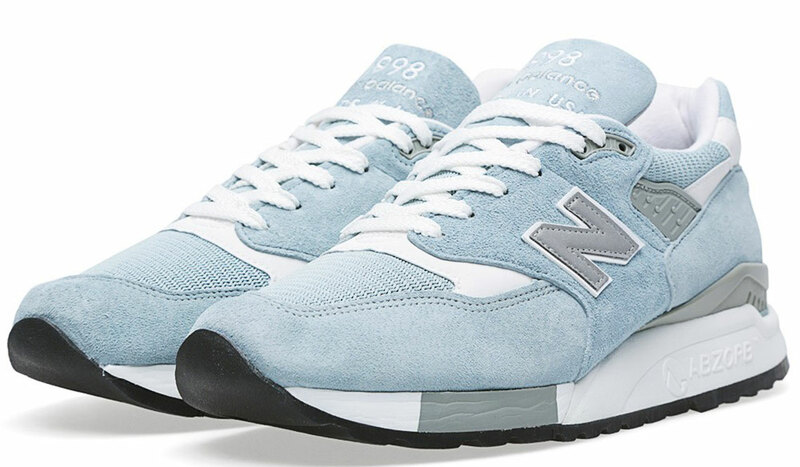 If ever there was an all-American sneaker that combined classic and modern styling it has to be the New Balance M998Ll – Made In The USA Sky Blue & White ($195). Even the sky blue and white color way makes you think of summer skies. All of the original details and features are in place, having being created using the latest technology. With the abzorb cushioned midsole and the mesh and pigskin uppers, these sneakers are perfect for both those who prefer old school and those who are thoroughly modern.